When we look at someone with good posture from the front their shoulders and hips should be level and there will be no tilt of the body to one side. When we look at someone from the side what we want to see is the head, shoulder, hip, knee and ankle all line up. If we took an x-ray of someone with good posture the spine would be nice and straight from the front and from the side there should be smooth curves flowing from the neck to the low back in the shape of an “S”. These curves act as shock absorbers against gravity and distribute force evenly throughout the spine. These curves also allow optimal movement and prevention of spinal degeneration. 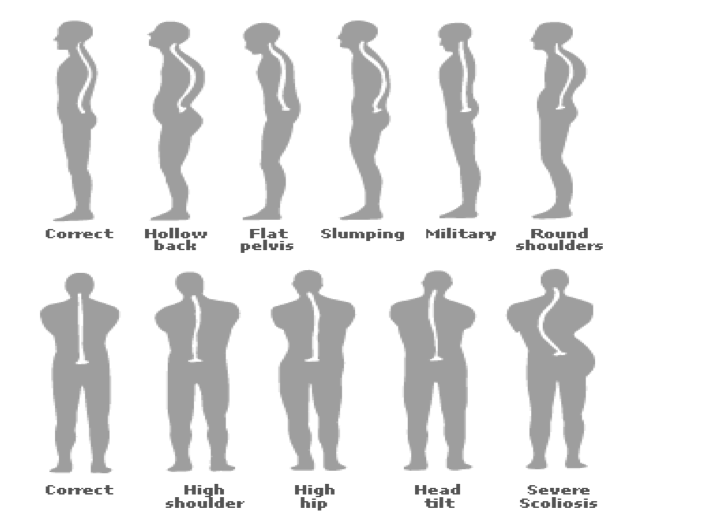 Poor postural habits contribute to alterations in these curves resulting in muscular imbalances and poor posture. Anatomically we haven’t changed much since our late ancestors, however our lifestyles have changed dramatically. Do you find yourself slouching right now? Have you noticed the people on the bus looking down at their phone? These are examples of activities contribute to poor posture. Poor posture increases stress on the spinal joints and the nervous system. Over time the increased load on the joints can manifest into painful conditions such as back pain, headaches and premature degeneration of the spinal joints. One of the most common conditions attributed to poor posture is muscle tightness and soreness. A common presentation we see here at Dee Why Chiropractic Care is an individual that has a sedentary lifestyle combined with poor posture will tend to have a lot of shoulder tightness and recurring headaches. The reason they suffer from this is because the weight of the head is approximately 4-5kgs (like a bowling ball) and when it is translated forwarded in relation to the shoulders there is an increased load on the spinal joints and muscles to support it. Imagine holding a bowling ball close to your body and then comparing it to how much harder it is to hold it out in front of you. Another factor that people forget about when it comes to poor posture is the effect it has on their range of motion. When we have good posture our vertebra move effortlessly as anatomically they have a great relationship with each other. Changes in our curves alter the mechanical relationship these spinal segments have with each other resulting in a reduction in movement. Try and turn your head side to side, noting how far you can turn. Now repeat this in an upright position. Note how much more motion you have in the upright position! The nervous system is responsible for every function in the human body; its what keeps us alive! The spine’s major role is to protect the nervous system, namely the spinal cord, which then sends out nerves to supply the body. Changes in spinal curves can lead to increased tension on the spinal cord and nerves leading to a reduction of nerve flow sent out to the body. Spinal degeneration as a result of poor posture can result in conditions such as bulging discs protruding onto the spinal cord and arthritic bone spurs impinging on exiting spinal nerves causing conditions such as shooting pain into the limbs, muscle weakness and wasting. We breakdown the areas that need to be addressed using an easy to understand posture photo. Incorporating specific in-clinic and home exercises with manual therapy to get you back to your best! If you are concerned about your posture and want to improve your spinal health, contact us at our clinic today.